JUST REDUCED TO SELL!!!! 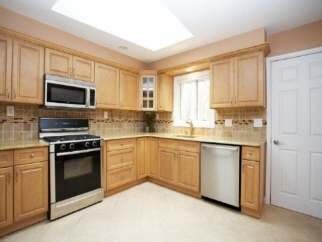 !Custom Built S/L home on a cul-de-sac located in the desirable Country Club section of Tenafly. This is not your typical home which has been completely renovated from top to bottom. starting with a beautiful cherry door that opens into your entry foyer with a skylight that leads into a beautiful formal living room with all new hardwood floors through out the home plus the moldings completes each room! The open living room extends into the formal dining room with an open kitchen to die for with all stainless aplliances, granite counter tops and the laundry room off the kitchen equipt with Borsch washer and dryer. Having a Master bedroom suite on the 1st floor with only a couple of steps to the good size bedrooms and a full bath. The family room which is off the kitchen area has a fireplace with sliding glass doors to your huge patio to enjoy. You have plenty of storage area and a powder room plus a 2 car garage. All this is waiting for you to call HOME!